Nintendo has announced a new hand-held console designed specifically for smaller children, dubbed the Nintendo 2DS and offering partial compatibility with its existing 3DS and DS lines. 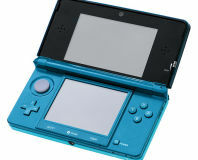 Nintendo's 3DS has been a smashing success for the company, thanks to backwards compatibility with existing DS games and its gimmick of glasses-free three-dimensional visuals from the top of two screens. Sadly, there's a section of the market it can't target: children under the age of seven are warned against using the 3D mode, as it can strain their still-developing eyes. Although it's possible to switch 3D off through the use of a depth-adjusting slider switch, it's difficult for less technical types to lock it off - requiring the user to set up a PIN code for a parental control system buried in the Settings menu - meaning parents have to simply trust that Little Jimmy won't just turn it back on when their backs are turned. As a result, many instead choose to buy Nintendo's cheaper, last-generation DSi or DS Lite devices, which lack the 3D feature altogether. These, however, can only be used with Nintendo DS games - although some models go back still further with Game Boy Advance compatibility - while the 3DS offers compatibility with 3DS games as well as last-generation DS titles. As a result, parents who cheap out on the older models will find their kids demanding games the devices simply can't play. Nintendo's answer to this dilemma is the 2DS, which is exactly what it sounds like: a two-dimensional version of the 3DS. Ditching the clamshell form-factor of its sibling - too easy for clumsy little hands to break, it seems - the 2DS is basically a 3DS-compatible tablet with a single display split into two visible areas, a design choice confirmed by US Gamer. As with the 3DS, the bottom display segment is touch-sensitive while the top has a piece of plastic covering it to disable this feature. Unlike the 3DS, however, the 2DS has no slider for adjusting the depth of the 3D effect - because it doesn't have a 3D display. The device also ditches one of the speakers for a monaural setup, but - strangely - keeps the dual rear-facing cameras intact, for capturing 3D pictures and video you'll never see in 3D. The console is being priced lower than the RRP of the 3DS at £109.99, but with the 3DS currently available at around £136 it may not be enough of a saving to tempt families into picking up a unit at launch on the 12th of October. 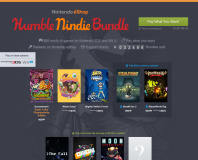 Nindie bundle not for non-Americans. 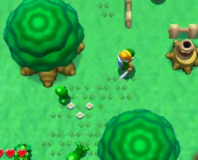 Nintendo has lost a patent lawsuit over the glasses-free 3D technology used in its 3DS.